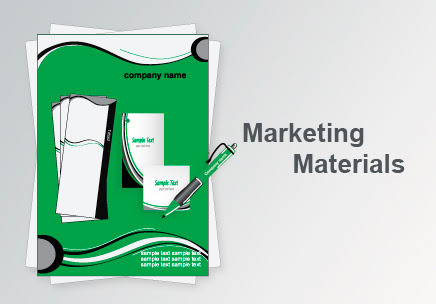 Marketing Materials are promotional and/or informational materials used to sell you and your services. These are the written pieces that communicate to your prospects and customers. Every company needs printed pieces that do a careful and well thought-out job of presenting its products and services: catalogs, newsletters, product sheets and brochures, letterhead, business cards, presentation folders, specification sheets, case histories or application sheets, special event brochures, annual reports, manuals, technical bulletins, posters, product insert sheets, labeling, recruitment materials and so on. 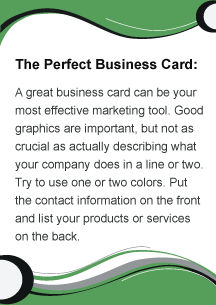 A business card typically includes the giver's name, company affiliation (usually with a logo) and contact information such as street addresses, telephone number(s), fax number, e-mail addresses and website. It can also include bank account and tax code.